This article is about the novel. For the television miniseries, see The Stand (miniseries). For the comic series, see The Stand (comics). For the comedy club by this name, see The Stand Comedy Club. For other uses, see Stand (disambiguation). "Project Blue" redirects here. For anime series, see Project Blue Earth SOS. The Stand is a post-apocalyptic horror/fantasy novel by American author Stephen King. It expands upon the scenario of his earlier short story "Night Surf" and outlines the total breakdown of society after the accidental release of a strain of influenza that had been modified for biological warfare causes an apocalyptic pandemic, which kills off over 99% of the world's human population. King dedicated the book to his wife, Tabitha: "For Tabby: This dark chest of wonders." Note that depending upon the edition of the novel, the events of The Stand occur in either 1980–1981, 1985–1986, or 1990–1991. At a remote U.S. Army base, a weaponized strain of influenza known as "Project Blue" is accidentally released inside a secret underground laboratory. Charles Campion, a soldier charged with security, manages to escape from the base by car with his wife and child. By the time the Army tracks Campion down to the East Texas town of Arnette and establishes a cordon sanitaire around it, he as patient zero has already died of the Project Blue virus and spread it to numerous others beyond the cordon. The virus is extremely contagious and resistant to antibodies and vaccines. A pandemic of apocalyptic proportions is triggered, which eventually kills off 99.4% of the world's human population. As the pandemic intensifies it gains many names, "Captain Trips" and the superflu being the most used. A multi-faceted narrative—told partly from the perspective of primary characters—outlines the total breakdown and destruction of society through widespread violence; the failure of martial law to contain the outbreak; the military's increasingly violent efforts to censor information; the rapid collapse of society; the deliberate exposure of the virus in the Soviet Union and China to guarantee their destruction as well and, finally, the near-extinction of humanity. The emotional toll is also dealt with, as the few survivors must care for their families and friends, dealing with confusion and grief as virtually everyone they know succumbs to the disease. The Complete & Uncut Edition opens with a prologue entitled "The Circle Opens" that offers greater detail into the circumstances surrounding the development of the virus and the security breach that allowed its escape from the secret laboratory compound where it was created. It also expands upon the Army's response to the outbreak; scenes of civil unrest, looting, and vigilantism; and deaths caused not by the pandemic itself, but by the resulting collapse of society. Intertwining cross-country odysseys are undertaken by a small number of survivors in three parties, all drawn together by circumstances and their shared dreams of a 108-year-old woman in Hemingford Home, Nebraska, whom they see as an embodiment of good. The woman, Abagail Freemantle—better known as "Mother Abagail"—becomes the spiritual leader for the survivors. Mother Abagail directs them to Boulder, Colorado, where they struggle to re-establish a democratic society called the "Free Zone". Meanwhile, another group of survivors is drawn to Las Vegas by Randall Flagg, an evil being with supernatural powers. Flagg's governance is brutally tyrannical, using gruesome methods of torture and execution to quell dissent. Flagg's group is able to quickly reorganize its society, restore power to Las Vegas, and rebuild the city with the many technical professionals who have migrated there. Flagg's group launches a weapons program, searching what remains of the United States for suitable arms. Mother Abagail, feeling that she has become prideful due to her pleasure at being a public figure, disappears into the wilderness on a journey of spiritual reconciliation. During her absence, the Free Zone's leadership committee decides to secretly send three people to Flagg's territory to act as spies. Harold Lauder and Nadine Cross, who are disaffected Free Zone inhabitants tempted by Flagg, stage an attack on the committee with a bomb. The explosion kills several people, but most of the committee members avoid the explosion thanks to Mother Abagail's return. The Complete & Uncut Edition expands on a character seen only in flashbacks in the original novel: The Kid, modeled after spree killer Charles Starkweather. The Kid travels west through Colorado with the Trashcan Man, one of Flagg's recruited henchmen. He states to the Trashcan Man that he intends to kill Flagg and take over as leader in Las Vegas when he arrives. In response, Flagg causes a pack of wolves to descend on the two travelers, allowing the Trashcan Man to flee unharmed, but the wolves kill The Kid after a standoff. Stu Redman's party, which is sent to Vegas later in the novel, find The Kid's remains and dub him "The Wolfman". The stage is now set for the final confrontation as Flagg's group becomes aware of the threat from the Free Zone. There is no pitched battle, however. Instead, at Mother Abagail's dying behest, four of the five surviving members of the leadership committee—Glen Bateman, Stu Redman, Ralph Brentner, and Larry Underwood—set off on foot towards Las Vegas on an expedition to confront Flagg. Stu breaks his leg en route and persuades the others to go on without him, telling them that God will provide for him if that is what is meant to happen. The remaining three are soon taken prisoner by Flagg's army. When Glen refuses to grovel before Flagg, he is killed by Lloyd Henreid, Flagg's second-in-command. Flagg gathers his entire collective to witness the execution of Brentner and Underwood. Moments before they are to be killed, the Trashcan Man arrives with a stolen nuclear warhead. Flagg conjures a magical ball of energy in an attempt to silence a dissenter, but it is transformed into a giant glowing hand—"The Hand of God"—which detonates the bomb, destroying Las Vegas and killing all of Flagg's followers, in addition to Larry and Ralph. The inhabitants of Boulder anxiously await the birth of a baby by Stu's love interest, Frances Goldsmith. They fear that the child may not possess an immunity to the superflu and may die, implying a permanent end to humanity. Soon after she gives birth to a live baby, Stu returns to Boulder, having been rescued first by dog Kojak and then by Tom Cullen, the only survivor of the three Free Zone spies. The baby, Peter, manages to fight off the superflu. The original edition of the novel ends with Fran and Stu questioning whether the human race can learn from its mistakes. The answer, given in the last line, is ambiguous: "I don't know." The Complete & Uncut Edition follows this with a brief epilogue, "The Circle Closes", which leaves a darker impression. While Stu, Fran, and baby Peter leave Boulder and return to Fran's hometown in Maine to establish a home front in the east, an amnesia-stricken Flagg wakes up on a beach on an unknown island, having somehow escaped the atomic blast in Vegas by using his dark magic to teleport away at the last second. There he begins recruiting adherents among a pre-literate, dark-skinned people, who worship him as a deity. With my Patty Hearst book, I never found the right way in... and during that entire six-week period, something else was nagging very quietly at the back of my mind. It was a news story I had read about an accidental CBW spill in Utah. (...) This article called up memories of a novel called Earth Abides, by George R. Stewart. For a long time—ten years, at least—I had wanted to write a fantasy epic like The Lord of the Rings, only with an American setting. I just couldn't figure out how to do it. Then . . . after my wife and kids and I moved to Boulder, Colorado, I saw a 60 Minutes segment on CBW (chemical-biological warfare). I never forgot the gruesome footage of the test mice shuddering, convulsing, and dying, all in twenty seconds or less. That got me remembering a chemical spill in Utah, that killed a bunch of sheep (these were canisters on their way to some burial ground; they fell off the truck and ruptured). I remembered a news reporter saying, 'If the winds had been blowing the other way, there was Salt Lake City.' This incident later served as the basis of a movie called Rage, starring George C. Scott, but before it was released, I was deep into The Stand, finally writing my American fantasy epic, set in a plague-decimated USA. Only instead of a hobbit, my hero was a Texan named Stu Redman, and instead of a Dark Lord, my villain was a ruthless drifter and supernatural madman named Randall Flagg. The land of Mordor ('where the shadows lie,' according to Tolkien) was played by Las Vegas. King nearly abandoned The Stand due to writer's block. Eventually, he reached the conclusion that the heroes were becoming too complacent, and were beginning to repeat all the same mistakes of their old society. In an attempt to resolve this, he added the part of the storyline where Harold and Nadine construct a bomb which explodes in a Free Zone committee meeting, killing Nick Andros, Chad Norris, and Susan Stern. Later, Mother Abagail explains on her deathbed that God permitted the bombing because He was dissatisfied with the heroes' focus on petty politics, and not on the ultimate quest of destroying Flagg. When telling this story, King sardonically observed that the bomb saved the book, and that he only had to kill half of the core cast in order to do this. The novel was originally published in 1978 in hardcover, with a setting date of 1980. The first paperback release in 1980 changed the setting date to 1985. The book was later re-released in 1990 as The Stand: The Complete & Uncut Edition; King restored some text originally cut for brevity, added and revised sections, changed the setting of the story to 1990, and updated a few pop culture references accordingly. The novel marks the first appearance of Randall Flagg, King's recurring antagonist, whom King would bring back many times in his later writings. 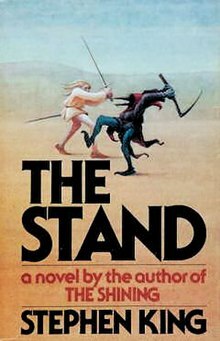 In 1990, an unabridged edition of The Stand was published, billed as "The Complete & Uncut Edition". Published in hardcover by Doubleday in May 1990, this became the longest book published by King at 1152 pages. When the novel was originally published in 1978, Doubleday warned King that the book's size would make it too expensive for the market to bear. As a result, he cut approximately 400 pages (around 150,000 words) from the original manuscript. This edition reinstates most of the deleted pages (as selected by King), as well as updates the setting from the 1980s to the 1990s. This new edition features a new preface by King, and illustrations by Bernie Wrightson. Additionally, Doubleday published a deluxe edition of The Stand: The Complete & Uncut Edition, limited to 1,250 numbered copies and 52 lettered copies. This edition, known as the "Coffin Box" edition due to the book being housed in a wooden case, was signed by King and Wrightson. The Stand was nominated for the World Fantasy Award for Best Novel in 1979, and was adapted into both a television miniseries for ABC and a graphic novel published by Marvel Comics. In 2003, the novel was listed at number 53 on the BBC's The Big Read poll. A movie adaptation of The Stand was in development hell for over ten years. During the 1980s, Stephen King had planned a theatrical film, with George A. Romero directing and himself writing, not trusting anybody else with the project. However, writing a workable screenplay proved difficult, due to the novel's length. King talked about adapting it for television, but was informed that the television networks did not "want to see the end of the world, particularly in prime time." Eventually King allowed screenwriter Rospo Pallenberg, who was a fan of The Stand, to write his own adaptation of the novel. Pallenberg's script would clock the film in at close to three hours, while still staying true to the novel. Everyone liked the script; however, just as it was about to finally come together, Warner Bros. backed out of the project. ABC eventually offered Stephen King the chance to make The Stand into an eight-hour miniseries for television. King wrote a new screenplay (toned down slightly for television). The miniseries was broadcast in 1994, directed by Mick Garris, and starring such actors as Gary Sinise, Molly Ringwald, Rob Lowe, Miguel Ferrer, Laura San Giacomo, Jamey Sheridan, Ossie Davis, Ruby Dee, Bill Fagerbakke and Shawnee Smith, with notable cameos including John Landis, Ed Harris, Kathy Bates, Sam Raimi and King himself. Parts of the miniseries were shot in Salt Lake City, Utah State Prison, Sundance, Orem, Provo Canyon and Salina in Utah. In January 2011, it was announced that Warner Bros. Pictures and CBS Films would be developing a feature-length film adaptation of The Stand. In July 2011, it was reported that the film may be a trilogy, and that David Yates was considering directing. On August 10, Warner Bros. finalized the deal for Yates and Harry Potter screenwriter Steve Kloves to re-team for a multi-movie version of The Stand. However, in October 2011, it was reported that both Yates and Kloves had left the project because Yates felt it would work better as a miniseries, and that actor/director Ben Affleck was Warner Bros.' new choice for the project. In August 2013, it was reported that Affleck had left the project for the role of Batman and Scott Cooper was in talks to rewrite and direct. Cooper later dropped out of the project over creative differences with the studio. On February 25, 2014, it was reported that Josh Boone was hired to write and direct the adaptation. On August 25, 2014, The Wrap reported that Matthew McConaughey was being courted for the main antagonist, Randall Flagg. Boone soon took to Twitter to denounce this rumor and revealed he actually wanted Christian Bale to play Randall Flagg and Matthew McConaughey for the role of Stu Redman. On September 10, 2014, Boone announced the script has been completed and that pre-production was underway. The adaptation was to be a single film of three hours. In the November 17, 2014 episode of director Kevin Smith's Hollywood Babble-On podcast, Boone revealed he planned to split his adaptation into four full-length feature films in an effort to remain true to the breadth of King's sprawling novel. In June 2015, plans were announced to adapt the novel into an eight part miniseries before the film was released. In February 2016, The Stand film had been put on hold, the rights reverted from Warner Bros. Pictures back to CBS Films, and the TV mini-series was abandoned. King said in September 2017 that there was talk about doing an extended TV series on Showtime or CBS All Access. Marvel Comics adapted The Stand into a series of six five-issue comic book miniseries. The series was written by Roberto Aguirre-Sacasa and illustrated by Mike Perkins. Colorist Laura Martin, letterer Chris Eliopoulos and cover artist Lee Bermejo were also on the staff. The first issue of The Stand: Captain Trips was released on September 10, 2008. ^ King used Hemingford, NE for both novels, The Stand, and It, America's heartland location for Mother Abigail. The Denver Post, USA Weekend, March 19–20, 2010, usaweekend.com, page 2. ^ King, Stephen. Stephen King's Danse Macabre. Berkeley Trade. p. 370. ISBN 0-425-18160-X. ^ King, Stephen. "Stand: The Complete and Uncut Edition: The Inspiration". Retrieved 2008-08-24. ^ King, Stephen (1990). The Stand: The Complete And Uncut Edition. Doubleday. p. xiii. ISBN 978-0-307-74368-8. ^ "ARMAGEDDON, COMPLETE AND UNCUT". The New York Times. 1997-03-09. ^ "Stephen King The Stand Signed Limited Coffin Edition". VeryFineBooks.com. Retrieved 2012-07-02. ^ "Stand, The – S/L – Palaver". Thedarktower.org. Retrieved 2012-07-02. ^ "1979 Award Winners & Nominees". Worlds Without End. Retrieved 2009-07-22. ^ "The Big Read – Top 100 Books". BBC. April 2003. Retrieved October 3, 2017. ^ Kit, Borys (2011-01-31). "Stephen King's 'The Stand' Heading to the Big Screen (Exclusive)". The Hollywood Reporter. Retrieved 2014-08-02. ^ Brodesser, Claude (2012-06-19). "What Is Warner Bros. Planning to Replace the Harry Potter Cash Cow?". Nymag.com. Retrieved 2012-07-02. ^ McWeeny, Drew (2012-06-28). "Exclusive: Potter masterminds Steve Kloves and David Yates reunite for The Stand". Hitfix.com. Retrieved 2012-07-02. ^ "David Yates Says He's Not Making THE STAND Because It Should Be TV Mini-Series". Whatculture.com. November 12, 2011. Archived from the original on January 17, 2012. Retrieved July 2, 2012. ^ Thompson, Anne. "More Details on Ben Affleck in Snyder's Superman/Batman UPDATED". IndieWire. Archived from the original on December 3, 2013. Retrieved August 2, 2014. ^ Shaw, Lucas. "'Crazy Heart' Director Scott Cooper Exits Warner Bros.' Stephen King Adaptation (Exclusive)". The Wrap. Retrieved 2014-08-02. ^ Kit, Borys (2014-02-25). "'Fault In Our Stars' Director in Talks to Tackle Stephen King's 'The Stand'". The Hollywood Reporter. Retrieved 2014-09-10. ^ Sneider, Jeff (2014-08-22). "Matthew McConaughey Courted for 'The Stand,' Nearing Deal for 'Gold'". The Wrap. Retrieved 2014-08-23. ^ Josh Boone (23 Aug 2014). "I have always wanted McConaughey as Stu and Bale as Flagg. Still not sure how that story leaked – just not true". Twitter. ^ "Hollywood Babble-On Bonus: Babble on Hollywood: Josh Boone: The Fault In Our Stand". smodcast.com. Archived from the original on November 20, 2014. ^ Fleming Jr., Mike (November 21, 2014). "Josh Boone Says Warner Bros Will Turn Stephen King’s ‘The Stand’ Into Four Films." Deadline. ^ "Stephen King's The Stand to Begin as an Eight-Part Television Miniseries! - ComingSoon.net". comingsoon.net. June 5, 2015. Retrieved February 6, 2017. ^ "'The Fault In Our Stars' Helmer Josh Boone Pushes Back Stephen King's 'The Stand' To Next Direct 'Revival'". February 2016. ^ Buchanan, Kyle (September 25, 2017). "Stephen King on His New Netflix Movies, It, and His Big Year". Vulture.com. Retrieved September 29, 2017. ^ Low, Elaine (January 30, 2019). "Stephen King's 'The Stand' Gets Series Order at CBS All Access". Variety.com. Retrieved January 30, 2019. ^ Stevens, Tim (May 31, 2008). "Wizard World Philadelphia 2008: Stephen King's The Stand". Marvel.com. Archived from the original on August 18, 2010. Retrieved August 2, 2014. Bookpoi—How to identify first edition copies of The Stand by Stephen King.